Pundits have long debated the root causes of crime and how to combat it, such as investing in education, early intervention, and programs to reduce unemployment. Those may be successful strategies from a social perspective, but what about technology? Can technology also be a safe-city enabler? Leverage Existing Security Systems to their Fullest Potential – Let’s face it, government agencies already invest a lot of money in security systems, ranging from street video surveillance to access control, license plate recognition (LPR), gunshot detection and other systems. Some of these systems are used by private organizations as well. So collectively, in a city, county or region, there is already a well-established and powerful security system infrastructure. Most times, the only thing lacking is the ability to connect it all together. But that’s changing. For example, Cleveland’s Shared Security Surveillance (CS3) program has been lauded for keeping “C-Town” safe. 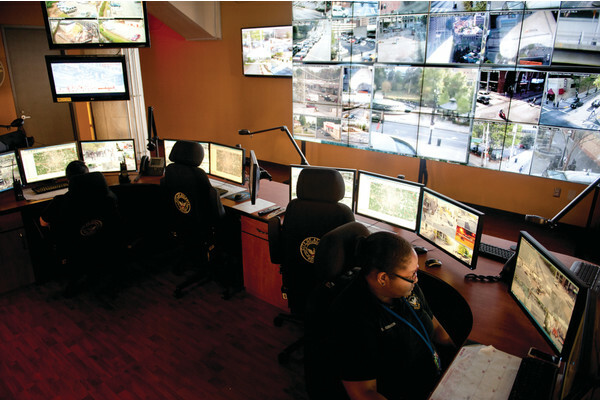 The initiative, which started as a small pilot program, has grown by leaps and bounds, with public and private cameras all tied into the City’s Public Safety network, and more expansion planned. The video is a force multiplier and crime solver. It has even been credited with helping to lower crime rates. PSIM offers one way to achieve this more easily. An open, overlay, vendor-agnostic solution, PSIM can combine any number of video management systems (VMSs) in one user interface. Control room operators just see the big picture. They never even know that there are different brands of VMS working behind the scenes. Unify and Correlate Security Information – Building on my last point, to the extent that different city agencies/entities invest in all of these security systems, why not centralize all of them in one place? And I don’t mean physically. What I do mean is having all of the information and alerts from these systems come into one centralized place – and what better place than the city control center? I’m not just talking sharing video feeds although that’s a big part of it. 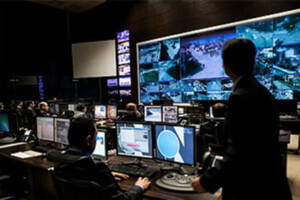 By feeding other sensors into the command center, a city can create a tight security net around the city. Think DoT video cameras, radiological sensors on the transit system, the access control system at a nuclear power plant, a perimeter protection system for a city water supply, a university’s campus emergency notification system. Now, if there’s a major accident on the highway, a terrorist incident, a campus shooting, a breach at a critical facility, the control center has the immediate real-time situational awareness they need to respond. Also because all of the information coming from these different city-wide (or regional) sources is now part of one system, it can be cross-correlated. Is what just happened on campus connected to this other event? Another big challenge cities have is piecing together forensic evidence in the aftermath of an incident. Here I’m not just talking about surveillance video, but police in-car video and cell phone video too. Today, through the aid of specialized technology, it’s possible to take all of these different types of video and combine them into one seamless incident timeline, along with first responder and 9-1-1 voice recordings and other multimedia. When assembled together as part of a complete picture, this information can provide extraordinary insight for investigators as to how an event unfolded. It is an unfortunate reality that the United States cannot seem to enjoy more than a few months without a highly visible, tragic and lethal attack on an unsuspecting public. The shooting at the Washington Navy Yard this morning stole the lives of 12 Americans who expected nothing more than another Monday spent serving their country. The former Naval Reservist Aaron Alexis entered the military facility in southeast Washington, DC, armed with an AR-15, a shotgun, a handgun and a deep well of indiscriminate hate. As with other tragic, violent incidents, there is a fog of facts and speculation circulating in the media, and it is not yet clear how Alexis entered the Navy facility, why he did so or indeed, whether he acted alone. Those details will become clearer as the FBI investigation continues, although the “reason” for Alexis’ terrible actions will never make sense. These kinds of tragedies never do. In the coming days, debates will rise in the press, in government and among the public. Some will use Alexis’ actions as an opportunity to champion a position on gun control. There will also be questions as to whether this was a case of workplace violence or an example of domestic terrorism. Assuredly, for the people who experienced the attack, and for the families of those who died, Alexis’ attack was terrorizing. There will also be hard questions about the level of security at the Navy Yard, and indeed, at all workplaces and government facilities. While debate and discussion is important, it will not diminish a repugnant reality. No place in this country is ever completely safe from the threat of violent actors. After the first shots were fired this morning, the full force of Washington’s Park Police, Metro PD, FBI and an army of civil servants descended on the Navy Yard. This took a matter of minutes. Meanwhile, the employees within the buildings heard fire alarms and quickly fell back on previous drills and training, all either moving for an exit or sheltering in place. It would seem, at this point, that everyone did everything right – or at least, everything they could. And yet, Alexis was still able to heartlessly snuff out a dozen lives and severely wound others. Sometimes, no matter what one does, it is not enough to escape the evil, violent actions of others. ScholarChip is one of the largest providers of smart card IDs for the K-12 market and also one of the largest providers of payment gateway and electronic signature solutions for the Higher Education community. Their K-12 ASP smart card solution has rapidly grown into an advanced and comprehensive security and multi-point attendance platform that is being used in school districts from major urban to suburban and rural areas. The key to effective campus security is taking an integrated and centralized approach, which is at the core of ScholarChip's Campus Security products, which we have detailed below. 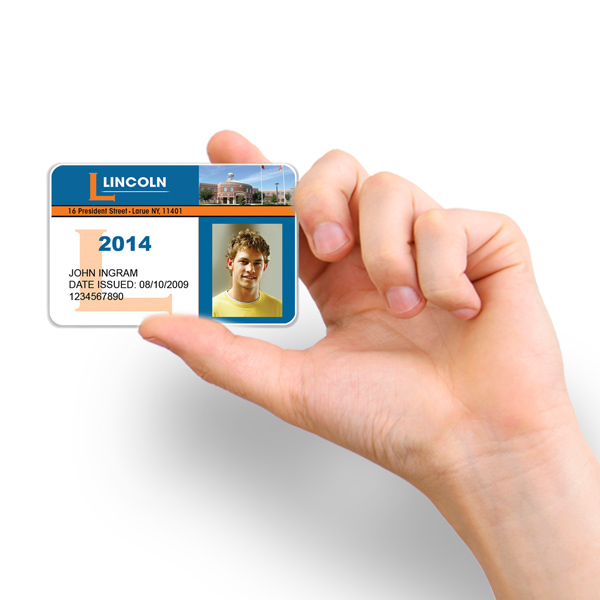 The mobile station has all the components necessary to rapidly photograph, register and print cards. The system ensures that only valid students are photographed. The student roster can be sorted and grouped by a variety of parameters. Multiple photographs can be taken and will be automatically corrected and attached to the student database. The Issuance Station also includes a full-color card printer with an integral contactless smart card encoder to provide one-step printing and encoding of the cards. The encoding is web-based through Secure Socket Layer channel (SSL) to ensure that a student has only one valid card at any one time and to prevent tampering or issuance of multiple valid cards. Access to buildings and secure areas is critical to campus safety and may be seen as an attendance event. ScholarChip’s access system is integrated natively into the platform requiring no additional software or management tool, resulting in both lower costs and ready installation. 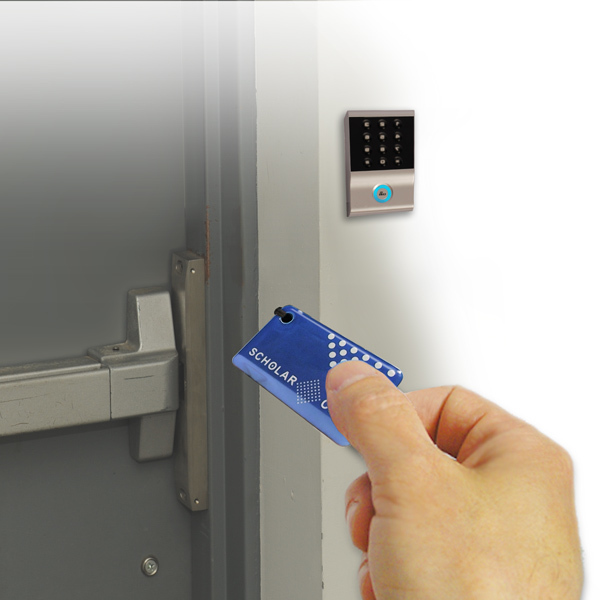 By integrating secure door access features into the centralized platform, access rights are guaranteed to always be accurate by a school’s management systems. Appropriate card holders are added and removed automatically, resulting in a secure and easily managed system. Mass notification is critical to operational efficiency and campus safety. ScholarChip’s notification service is integrated natively into the platform and the system interfaces with ScholarChip kiosks, while alerting all members via landlines, cell phones, text message and e-mail. Mobile kiosks are designed to be multi-purpose and to be where needed. Building attendance and large group attendance data is captured when students tap their card onto one of the two readers placed atop the kiosk. When a student taps their ID card, the system displays a photo of the student to the student and kiosk operator, with average speed of 45-50 students/minute/kiosk. Kiosks may be configured to generate audio and a visual alert for students with open attendance or discipline issues. Kiosks may be used to display a student-specific message issued by school administrators, to provide administrators with a tool for timely intervention. Kiosks are fully integrated with ScholarChip Tier l architecture and are both self-configuring and self-monitoring. ScholarChip’s dynamic reporting can identify “at risk” attendance issues and help to identify attendance trends in creating retention strategies. ScholarChip® card-based classroom attendance simplifies and speeds the taking of classroom attendance down to the tap of a card. Card-based attendance requires little or no instructor intervention, resulting in more time on task. Depending on class size, card readers may be wall-mounted or connected to the classroom PC. Card-based attendance reduces the inconsistencies seen when instructors take classroom attendance, providing administrators with more reliable and uniform attendance reporting. In college and university settings automated classroom attendance may be used to capture a student’s fulfillment of class time requirements. In a K-12 environment the application identifies each student as On-Time Present, Late Present, or if no card taps are detected, as Absent. These three time deltas define ‘Present’ and ‘Late’ within the length of the period. K-12 classroom attendance data is automatically reconciled with building attendance data. Class cuts are reported as they happen. Students that tap into class without having first been recognized at a building entry kiosk are reported. Please include attribution to Intelligent Travel with this graphic. Healthcare industry has embraced technology in a big way during the last few years. This has created a unique digital landscape that includes the creation and distribution of electronic records, exchange of health information, accessible care and so much more. All this has increased the quality of service offered by healthcare providers to their patients. However, as healthcare providers migrate from prescription pads to iPads, it opens up cyber security problems. There are two major problems facing the healthcare industry - computer viruses and unauthorized use of personal data. There have been many instances of hackers getting into a healthcare provider's network to access information about patients. One such example is that of Sutter Health, a company that offers services in more than 100 town across California. Hackers accessed the information of millions of Sutter Health's patients due to multiple breaches that existed in the network. This led to a massive lawsuit worth millions of dollars. In another case, hackers infiltrated the Utah Health Department's database to access 780,000 Medicare records including 250,000 social security numbers. These breaches have proven to be costly for the healthcare industry. Another problem is computer viruses and worms, which have caused enormous losses for the healthcare industry. In one example, the IT department failed to identify a virus at the Gwinnett Medical Center in Georgia. This virus infected the entire network, so employees had to revert back to paper records. Such situations can be avoided with diligence and sound security practices. This is why two engineering researchers from the University of Michigan will team up with other experts from across the country to work on the cyber security of healthcare systems. These experts will use scientific methods to identify the problems and will provide solutions for the same. It is hoped that this research will help the healthcare industry to tackle its cyber security challenges. We went searching for some insightful presentations on cybersecurity in the healthcare sector and were bombarded by overly complicated and ultimately uninformative PDFs that failed to get to the point. However, after some digging, we came across this 2005 presentation titled, "Cybersecurity for Medical Devices: Three Threads Intertwined," that is very clear, short, and paints a great picture of the basic principles of cybersecurity as it relates to the healthcare sector. Social media creates new opportunities for emergency management every day. That’s the message that will be delivered during a new portion of the upcoming annual conference for the National Association of Government Web Professionals in Louisville, Ky. On Sept. 27, speakers will discuss emergency communication and how ideas like MCUrgent, a social media aggregator created by association Treasurer Carol Spencer, can bring emergency managers up to speed with the technical elite. Spencer, the former mayor of Denville, N.J., and now the digital and social media manager for Morris County, N.J., said she is pushing for more interaction between Web staff and emergency managers because they have a lot to learn from each other. It’s not enough to just throw up a Facebook page or create a Twitter account, she said. The disciplines of social media and emergency management need to cross-pollinate before disasters happen, not during those difficult periods. “Five years ago, I had to really convince people that social media wasn’t a fad and I talked about email notifications. When I did it this year, I don’t even have to talk about that for social media,” Spencer said. “Everybody gets it.” But even with more people using and learning about technology that can aid emergency communications, most people are still a few steps behind what is possible, Spencer said. MCUrgent, for instance, looked at emergency communications on the local level and fixed a major institutional problem. MCUrgent is a social media notification system that allows alerts issued through social media or via text message to be sent across a central countywide platform. Citizens who subscribe to the system will receive alerts about emergencies that cross municipal borders. Spencer trained employees in 15 of the county’s 39 municipalities to use MCUrgent’s account with HootSuite, a social media management system. And now when a city or town needs to announce a gas leak or road closure, it does so through MCUrgent, and that message is pushed through not just the city’s Twitter and Facebook feeds, but also a countywide feed. 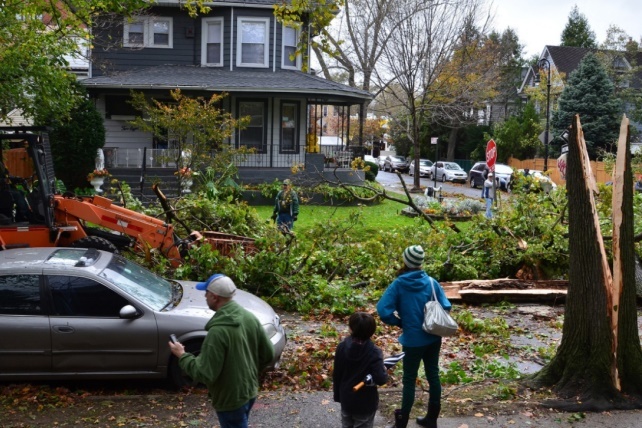 “Emergencies don’t end at a municipality’s boundaries,” Spencer said. If Denville residents were shopping four towns over during a major flood, for instance, how would they get important information without a central platform like MCUrgent, Spencer asked. No one is going to try to search through four different government websites and piece together the road closure information so they can get home. It didn’t make sense the way it was being done before, she said. But now the information is issued countywide and locally on social media, the governments maintain their autonomy, and there’s no central authority required to manage everything, save for the initial training that employees may need about HootSuite. During Hurricane Sandy, Spencer said a woman asked why her town wasn’t issuing announcements on Twitter and Facebook while other towns were. People expect governments to use social media and use it well, she said. “[MCUrgent] matches government communications with public expectations,” Spencer said. Spencer also encourages MCUrgent users to use a lesser-known Twitter feature called Fast Follow, which enables SMS notifications of the Twitter feed so they can still receive information quickly on their phone in case of a power outage or cell service disruption. This not only further broadens the reach of the news the county and its municipalities want to disseminate, but also helps reach those who are less technologically able and may not feel comfortable with Twitter, she said. Spencer developed the technical portion of MCUrgent, and the only ongoing cost is to maintain the HootSuite account. Spencer said she is now building marketing strategies to help convince the remaining municipalities to participate and to inform the public about the service. Spencer was recognized by NASCIO (PDF) for her work on MCUrgent, and HootSuite published a case study of the project on its blog to demonstrate social media's benefits for emergency communications. Social media is so valuable, Spencer said, that it doesn’t make sense for emergency management not to make the most of it. “I was mayor in 1999 when Hurricane Floyd put my entire downtown underwater, and we didn’t have any way to communicate with people,” she said. “There wasn’t any Twitter or Facebook. Even the Web was pretty novel for people at home in '99.” When she first discovered Twitter it was like a revelation, she said. Web staff members don’t understand the details of emergency management and emergency managers don’t spend all day on Twitter, she said, so when an emergency hits, a government's social media person is usually required to come help and they’re in an unfamiliar environment. An emergency is the wrong time to try to educate those two parties on how to work together, she said. Speakers to be featured during the emergency communications segment of the National Association of Government Web Professionals conference include: Jeffrey Paul, emergency management director for Morris County; Jim Garrow, health communications specialist at the Philadelphia Department of Public Health; and Jody Duncan, public information officer for MetroSafe in Louisville, Ky., who will talk about how the city handled a chemical train derailment. The second half of the day will include a lot of open discussion, Spencer said. And they’re going to cover a broad spectrum of emergencies because while they’re all different, social media plays an important role in managing those events. At a past conference, Spencer recalled the social media director for Blacksburg, Va., talking about what happened after the shooting at Virginia Tech in 2007. “One of the things I remember him saying is, ‘One minute, you’re just doing your job and the next minute you are the subject of worldwide press coverage.’” This conference, she said, is a step toward helping emergency managers become an authority on social media. Back to school usually means new notebooks, new clothes and new teachers. But this year it also means more security, after the shooting deaths of 20 children and six adults at Sandy Hook Elementary School in Newtown, Conn.
“We would be remiss if we didn’t take a lesson from the Sandy Hook shooting, as horrible as it was,” said North Carolina Republican Rep. Craig Horn. He co-sponsored the state’s new plan to allow retired police officers or military veterans to serve as volunteer school security officers if they meet requirements set by local sheriffs and police chiefs. More than 450 bills were introduced in statehouses this year on school security measures. After thousands of hours of debate, what emerged at the state level are relatively small-scale plans to pay for security upgrades like adding classroom-door locks that can be used from the inside and outside, fortifying school entrances, installing security cameras and allowing teachers or volunteers, in very limited circumstances, to carry guns on campus. None of these are transformative solutions, said Ken Trump, a Cleveland-based school safety consultant who most recently worked with the Connecticut safety council to advise them on best practices in building safety. Trump noted that just a year ago, all the focus in school safety was on preventing bullying, which has moved to the back burner in favor of emergency drills and preparing for what to do if there’s a shooter in a school. In Ohio, South Dakota, Texas and North Carolina, state legislatures empowered local districts to decide if they want to allow a trained school employee or volunteer to be an armed guard at a local school. In North Carolina, there will likely be few schools that participate, said Eddie Caldwell Jr., general counsel for the North Carolina Sheriffs’ Association, since both the local sheriff and the school board have to agree, and many sheriffs are skeptical of having an armed non-law enforcement officer in a school. However, the idea gained enough political traction to become law in four states and encourage teachers nationwide to sign up for gun training. The plan was also endorsed by Ohio Republican Attorney General Mike DeWine, both in response to the shooting in Newtown and a school shooting earlier in 2012 at a Chardon, Ohio, high school which left three students dead. “If I was on a school board … I would seriously consider having someone in that school who may be an ex-police officer, someone who has significant training, who had access to a gun in a school,” DeWine said in December. DeWine’s office issued a report in June with recommendations for schools to develop school safety plans, including model directions to teachers to use any means necessary to stop a shooter, including throwing books, and assaulting or choking the shooter. All Ohio schools are required to file an updated school safety plan with the attorney general’s office. In Texas, if local school districts give the OK, schools will select one anonymous staff member per every 400 students to carry a gun on campus, to act only if they identify an imminent threat. Training for that program will likely begin in the spring of 2014, according to the attorney general’s office. South Dakota opens its program to school employees or community volunteers, who must pass a criminal background check, go through an interview with the school board and pass a basic law enforcement training course before they can serve as an armed guard at a school. South Dakota Republican Attorney General Marty Jackley just approved the training guidelines last week and while no one has signed up yet, the attorney general’s office expects to begin offering training within the next month or two, according to a spokesperson. North Carolina’s plan falls on the more restrictive side, as the only people who can volunteer are retired police officers or military veterans. Once a school district and local law enforcement agency together decide they want to allow volunteer guards, the guards fall under the responsibility of the law enforcement agency. “The sheriff’s department has their own reputation on the line with this, so we feel confident they’ll pick the right people,” said Horn. He said volunteers will go through a strict vetting process so that, for instance, a military veteran with post-traumatic stress disorder is not guarding an elementary school. So far, no North Carolina district has expressed interest in the plan, so armed volunteers aren’t likely to end up schools until the 2014-2015 school year. While some lawmakers are on board with the idea of a trained volunteer carrying a gun in a school, others are saying no. After hearing about the Arkansas town of Clarksville’s plan to give teachers free firearms training and a $1,100 stipend to purchase a handgun, Arkansas Attorney General Dustin McDaniel issued a quick opinion clarifying that guns are not allowed on school campuses. At least 12 other school districts also had begun training teachers to act as school security. At the national level, the School Superintendents Association is firmly opposed to having teachers and administrators carry guns. Arming teachers has also been lambasted by teachers’ unions and public health experts. “Guns have no place in our schools. Period,” said the nation’s two largest teachers’ unions, the American Federation of Teachers and the National Education Association, in response to the National Rifle Association’s proposal to post at least one armed teacher or administrator in every school in the country. And given the statistical reality of being a gun violence victim in school—which is about one in 1 million, according to a joint report from the U.S. Department of Education and the U.S. Secret Service—having a gun to reduce gun violence may actually do the opposite. In Connecticut, teachers rejected the idea of carrying guns in the classroom and the state School Safety Infrastructure Council is looking at simple solutions like locks or communications systems. During the 2010-2011 school year, there were 11 homicides of children ages 5-18 at school, which was less than 2 percent of the total number of homicides of school-age children for each year going back to the 1992-1993 school year, according to a report from the Congressional Research Service. In 2007, the most recent year for which a national count is available, there were just under 20,000 trained school resource officers in the nation’s 98,000 public schools, according to the Department of Justice. Only about 25 percent of those officers were in elementary schools. That will likely increase this year, said Mo Canady, the executive director of the National Association of School Resource Officers. Regardless of which state they live in, students heading back to school this month can expect to see more police officers, either designated school resource officers or regular police, said Canady. Students and teachers will also have to participate in more drills to prepare not just for an active shooter, but for tornadoes, fires or other disasters. Since January, 11,041 Ohio teachers and staff have received specialized training on how to respond, without a gun, to a shooter in the building. There are 28 more scheduled trainings in school districts this year. This training is also happening in Indiana, Oregon and Michigan. The Department of Homeland Security has an online course for the public to learn how to respond to an active shooter. Jeff Brantingham, creator of PredPol, demonstrates computer-generated "predictive policing" zones at the Los Angeles Police Department Unified Command Post in Los Angeles last year. Motorola Solutions is combining its public safety and retail technology to assist the Cook County Regional Organized Crime (CCROC) task force in ongoing efforts to combat organized crime, including retail theft. The National Retail Federation estimates businesses are losing up to $30 billion each year to organized retail crime. CCROC is a task force of law enforcement and retail partners formed by the State’s Attorney’s Office in 2010 to battle the escalating crimes of organized retail theft and fencing in the Chicago metropolitan area. CCROC is unveiling a new strategic operations training center, which will serve as the main crime information hub for the task force. “Here in Cook County we have been working in unprecedented ways to increase the investigation and prosecution of organized retail theft and this new operations center is going to provide us with an extraordinary opportunity to continue to bridge the gap between law enforcement and retailers. Thanks to the generous commitment of our retail partners, we are a model for the nation in battling this type of crime that has such a menacing impact on the average consumer,” says Anita Alvarez, Cook County’s State’s Attorney. Organized Criminal Enterprises include groups, gangs and sometimes individuals who are engaged in all types financial crimes including organized retail crime, credit card fraud, bank fraud, identity theft, intellectual property crimes, and cargo theft. Obtaining retail merchandise through both theft and fraud in substantial quantities is all a part of a criminal enterprise. These crime rings generally consist of "boosters" - who methodically steal merchandise from retail stores - and fence operators who convert the product to cash or drugs as part of the criminal enterprise. Sophisticated criminals have even found ways to switch UPC bar codes on merchandise so they ring up differently at checkout, commonly called "ticket switching." Others use stolen or cloned credit cards to obtain merchandise or produce fictitious receipts to return products back to retail stores. JCPenney is donating the 5,500 square-foot facility located in the North Riverside, Ill. Mall, which will house law enforcement offices for various police departments, government agencies and retailers for the purpose of hands-on training and collaboration. “We’re proud to be a founding partner of the CCROC task force, and we’re pleased to donate space for the operations training center. The center is an integral tool in derailing organized crime, and allows all participants to collect and share information like never before,” adds Stan Welch, vice president, JCPenney Loss Prevention. The center will utilize technology from Motorola’s Real-Time Crime Center solution, which was introduced earlier this year, to bring together streaming video, incident and criminal complaints, access to arrest records, photographs, multi-media inputs and more. All this data – which currently resides in separate databases – can be integrated together by CCROC to provide crime solving intelligence in seconds instead of hours or even days as done today. The Real-Time Crime Center solution correlates the data into intelligence to help curb crime as it happens, aid in longer-term investigations and potentially increase both arrest and prosecution rates. Situational awareness made available with Motorola’s Real-Time Crime Center solution is made actionable with the integration of a radio console to enable real-time direct voice communications with officers in the field and real-time video streaming to a vehicle or handheld device over existing carrier or private wireless networks. The swift and successful investigation of the terrorist attack during the Boston Marathon shined a bright light on the value of both public and private-sector video when shared with police. It’s common knowledge that police regularly ask public organizations, businesses and individuals to share video that might help in the investigation of a crime; however, in recent years, police requests for video have grown into formal programs. Police departments in Philadelphia, Elgin, Ill., San Ramon, Calif., and Ventura, Calif., for example, all have programs that ask organizations and individuals to register surveillance cameras. 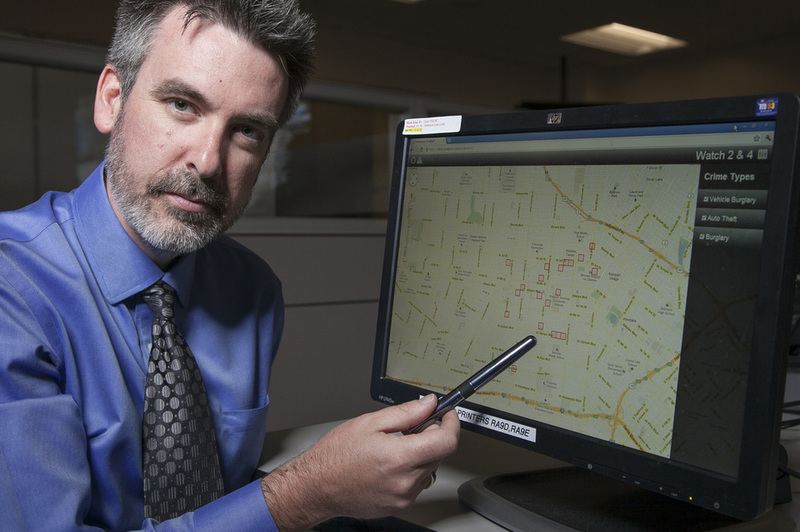 The police then map the cameras and consult a detailed surveillance map when a crime is committed. Some cities — Atlantic City and Atlanta, for example — have automated the process and can tap into cameras online from command centers. Registering and Mapping Cameras in Ventura, Calif. When a call comes in, the CAD system scans the registered cameras, Turner explains. If the system finds cameras that cover the location of the call, a flag with an address pops up on the screen in the vehicle of the responding officer, who will then contact the owners of the cameras by phone, e-mail or in person. For less serious crimes, officers ask the camera owners to review the video before and after the time the call came in and let them know if anything that might be useful. If there is useful video, the officer asks for or makes a DVD copy to retain as evidence. “For serious crimes like murder, we will review the video immediately and make a copy if it has evidentiary value,” Turner says. The Ventura Police Department has also knitted together a network of city-owned cameras watching areas of the city as well as cameras from middle schools and high schools. The school installations include exterior cameras and interior cameras in the lobbies and large common areas, such as cafeterias and gymnasiums. The system was not designed to intrude — it was designed to help police in the event of a dangerous emergency such as an active shooter. Video from city and school cameras feeds into the transportation center in the police station where it can be monitored. The system includes cameras from several manufacturers. To view it at the police monitoring station, something has to convert it. For that, the police use a VidSys Physical Security Information Management (PSIM) system that integrates security devices and operational data into a single system. “We have interfaces written between the system and all of the different cameras,” Turner says. 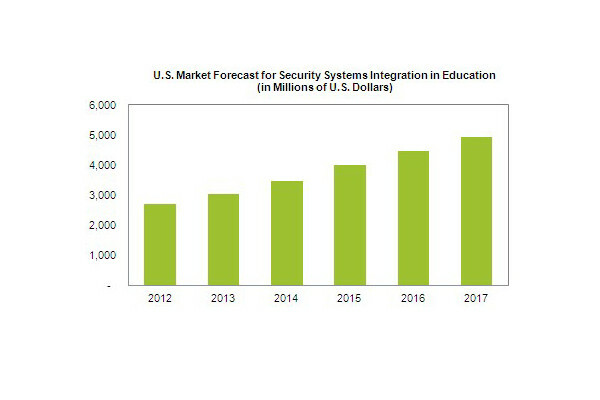 The U.S. market for school security system integration is expected to rise by more than 80 percent over the next five years, increasing from $2.7 billion in 2012 to $4.9 billion in 2017, according to new research from IHS. In fact, according to a new report entitled “Vertical Insights: Video Surveillance & Security in Education,” double-digit growth is expected every year throughout the forecast. The research firm says that high-profile shootings such as last year’s massacre at Sandy Hook Elementary School have had a huge impact on school officials and their views of how security systems should work. IHS said video surveillance and security systems that can reduce the possibility, or that provide quicker response times to incidents as they are occurring, have an advantage over those that cannot. Below is a great and short presentation compiled by CNL Software, detailing the trends of PSIM (Physical Security Information Management) and the different levels of complexity that differentiate between various PSIM systems. The Ekahau school safety solution, allows teachers to easily utilize a wearable Ekahau Wi-Fi badge in the event of a security or health emergency and the Ekahau badge sends a request for assistance within seconds, including event details and the teacher’s location, to the school’s Resource Officer and local dispatchers. Ekahau’s 2-way RTLS messaging solution eliminates the need for manual dialing and map look-ups; pulling down on a badge places a school into lock-down. During emergencies, dispatchers may also use Ekahau messaging software to send mass communication texts to badge-holders, directing teachers and classes away from danger without dependence on cellular networks. In addition, the Ekahau Forensics Replay™ software feature allows administrators to test emergency plan effectiveness by reviewing second-by-second event replays. Ekahau is the recognized leader in location-enabling enterprise Wi-Fi networks. Our mission is to provide the easiest, most cost effective and accurate positioning solutions for locating people, assets, inventory and other objects using wireless enterprise networks. Our solution tracks wireless laptops, PDAs, VOIP phones, Wi-Fi tags and other 802.11 enabled devices. Since year 2000, Ekahau has been the center of innovation for Wi-Fi based software and Real Time Location Systems - birthplace of the first commercially available Wi-Fi based location tracking system, the first visual Wi-Fi site survey tool, and the next-generation Wi-Fi tag family, T301. Ekahau’s patented core technology together with elite experts gives us a sustainable competitive advantage today and in the future. An integral part of any Safe City is the ability to secure educational institutions and guarantee that schools have measures in place in the case of an emergency. The school security debate continues in this country as school shootings and violence continue to make headlines. The appropriate measures to institute effective school security are hotly debated and range from panic alarms, CCTV, and armed guards. However, one important and often over looked aspect of this equation is the training of school personnel and students in the necessary emergency response plans that must be implemented in the event of a crisis. Posting a School Resource Officer on campus is a great way to not only educate teachers on emergency response plans but also to guarantee that a safety expert can take charge and lead the implementation of any emergency plans when a crisis occurs. The National Association of School Resource Officers (NASRO) has provided a great audio interview, which we have included below, and a downloadble PDF presentation here. Schools across the U.S. have been implementing Safe Schools programs and measures since the tragedies of Sandy Hook elementary and the recent tornado that hit Oklahoma, including an elementary school, in order to ensure school security and safety. The various programs and initiatives across the country vary greatly and range from a technology driven approach to one focused on an increase in public safety or security personnel on campus. A recent article highlighted an emerging technology called District Link developed by Lone Star Communications, that adopts a technology driven approach to the issue and offers school personnel an innovative method of establishing secure communications, comprehensive school security, and a method to immediately implement evacuation or safety procedures with the use of an easily accessible app. The recent tragedy in Boston has yet again reminded us of the present dangers that terrorism poses to our way of life and so far has left us with more questions than answers. Since 9/11 there have been about 63 foiled terrorist plots targeting the US, and in the decade following 9/11 these plots have evolved in numerous ways. Believe it or not, the US has been successful in combating Al Qaeda, however in doing so terrorists have had to improvise and learn their trade craft on their own, often being unable to communicate with actual Al Qaeda operatives or travel abroad to receive training. It is still unclear who is responsible for the attack in Boston and the range of suspects is too wide to speculate. It could very well turn out to be that a white supremacist group or other was responsible rather than a radical Islamic group. I've attached a 2012 report published by The Heritage Foundation, which documents foiled terrorist attacks since 9/11. While the document focuses on Islamic terrorist organizations, and we do not know who is responsible for Boston, it is useful in examining the evolution of homegrown terrorism tactics in order to have a better understanding of what similar attacks may look like in the future and of the event in Boston itself.